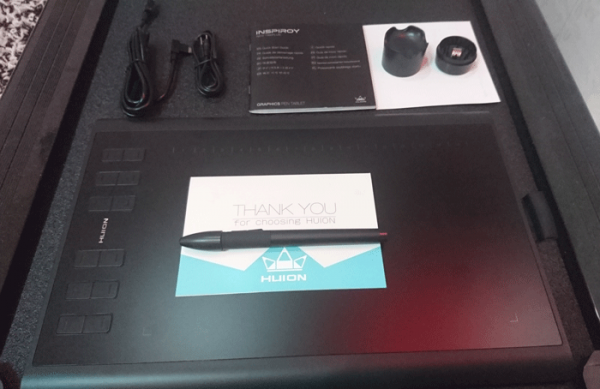 Huion New 1060 Plus Review, a graphics tablet with 8192 levels of pressure sensitivity & 12 hot keys. HUION New 1060 Plus is a good graphics tablet from Huion, with a size good enough to draw comfortably, while I would prefer to use a larger size personally, it’s a still good size to draw on a variety of screen sizes (I tried it on screen sizes between 11-inch to 17-inch). Add to that the number of hot keys we got, which is among the highest I have seen in a tablet, we get a nice deal. If you’re not one to use such keys, this may not matter to you though. 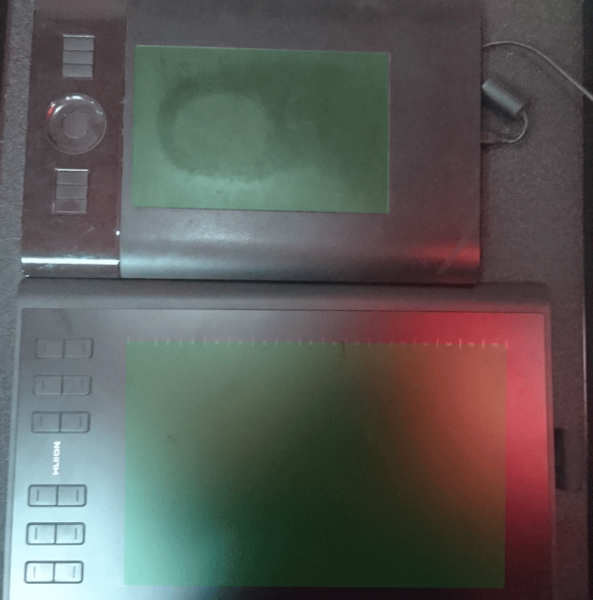 With the exception of one issue I had with the driver, where the tablet stops working after some times (I talked about it in details below, as well as how to hopefully fixed it), installing & using HUION New 1060 Plus has been a smooth experience for me, and I recommend it to anyone looking for an affordable graphics tablet. Has many hot keys:- Which makes it possible to eliminate the need for keyboard for some people. Is large enough for drawing for a small graphics tablet. Is not without driver issues, which can be annoying at times. The friction between my hand & the tablet wasn’t comfortable for me personally. Works with many drawing programs, as well as photo-editing ones. Comes with a 8 GB micro SD card. Supported operating systems:- Windows 7 or later, or Mac OS 10.11 or later. Doesn’t support touch or wireless connectivity. Once I opened HUION New 1060 Plus’s box. You get Thank you card, which you usually get from Huion products. HUION New 1060 Plus itself. The Pen with a pen cap on it. 8 Spare nibs inside the pen holder. 8GB Micro SD card, already inserted inside the tablet itself. There’s a pen sleeve at the side of the tablet, to carry it around easily. On the top of HUION New 1060 Plus, there are 12 hot keys, which I talked about in more details in its own section. I like it when there are more & more keys in a graphics tablet. Between the hot keys, there are two green leds that lights up every time the pen tip touches the tablet. It feel plasticky, but in a good way, it doesn’t feel cheap or anything. It’s lightweight, which makes it easy to carry and move it while drawing (I tend to place my tablet on my lap while drawing, so this is important to me). The rounded edge makes it look elegant too. Let’s talk about the things that affects your drawing experience with HUION New 1060 Plus. 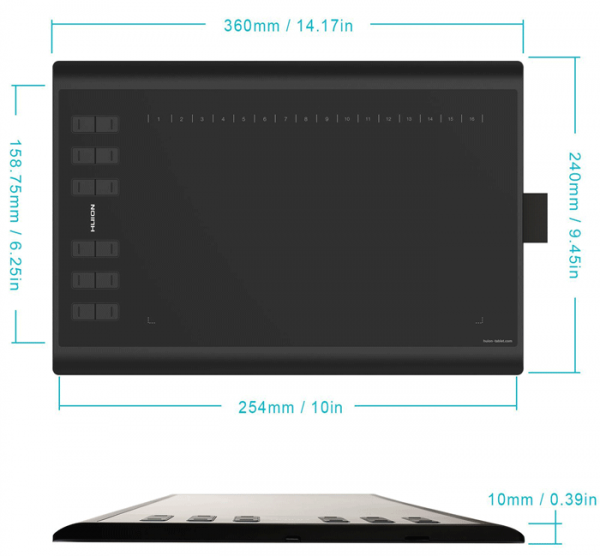 As mentioned above, The active area of HUION New 1060 Plus is 10-inch x 6.25-inch, making it large enough to draw comfortably for a small tablet. I tend to recommend medium-sized tablets to draw precisely, but HUION New 1060 Plus is a nice start if you can’t afford a larger table. 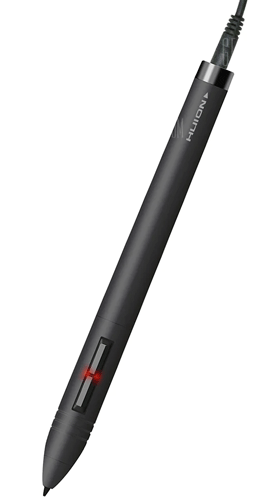 HUION New 1060 Plus features 8196 levels of pressure sensitivity, which is the standard these days. 2048 levels used to be the standard not that long ago. If you’re new to graphics tablets, pressure sensitivity allows you to vary the brush size by applying more pressure on the tablet surface. Similar to traditional drawing media, and more. You could use pressure sensitivity to vary the brush opacity as well. Having a lot of pressure is nice and all, and I wouldn’t mind it at all, but I wouldn’t make having less pressure than that an issue, as a graphics tablet with 1024 levels would still allow you to draw however you want. HUION New 1060 Plus doesn’t support tilt sensitivity, a feature most artists wouldn’t need (but would be nice to see in Wacom competitors).That’s particularly the case if you’re new to drawing & editing digitally. The friction between the tablet and the pen feels nice, and it made it fun for me to draw with it, and it didn’t seem like it wears down the pen nib, something many artists don’t like to see in a graphics tablet. However, I felt the friction my hand had with the tablet itself wasn’t very comfortable at times. Wearing a glove could solve that, but I would personally avoid that if possible. s tablets. You may need to change the pressure sensitivity in the driver to completely match the way you want. To make sure my experience with HUION New 1060 Plus won’t be different than your, I have tried HUION New 1060 Plus on 3 computers, and across 3 different operating systems. As I mentioned earlier, HUION New 1060 Plus has 12 hot keys, which is a lot compared to all the tablets I have ever seen. If you’re the kind that prefer to use the tablet without reaching out for the keyboard. Besides the 12 hot keys, there are 16 hot cells keys you could enable and use with your pen for additional shortcuts. They are not as easy to use as keyboard shortcuts, but they are nice to have. One thing I don’t like about the hot keys are how they are divided into 2 groups, one at the top of the tablet, while the other at the bottom, making using all of them comfortably a bit hard. I had this issue with the large Wacom Intuos Pro, which is a tablet I used for a long time. The issue with hot keys is that it’s hard to use them if you’re the kind of person that requires many shortcuts (using the keyboard is better in that case), but they are nice to do specific tasks, like sketching or doing specific edits. There’s no rocker button or touch ring to resize the brush dynamically on HUION New 1060 Plus. But you can map two of the keys to do any of these tasks. Each of the hot keys or hot cells can be assigned to a keyboard shortcut or mouse click, or to run a specific program. By the time I am writing this review, Huion driver doesn’t support application-specific shortcuts, where each hot key does a certain function in one application (say Photoshop), while it does a totally another function in some other program, like Paint Tool Sai or Corel Painter. This is a very useful feature I hope Huion to implement in the future. 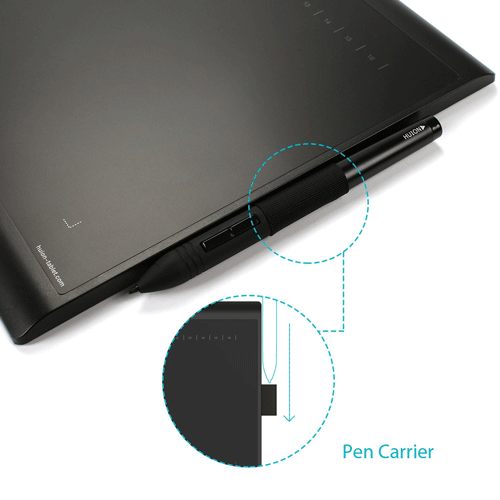 The drawing pen that comes with HUION New 1060 Plus is slightly thinner than Wacom’s, and it is easy to carry. On the side of the pen, there are two buttons you could customize to your heart contents, I personally like to set them to undo & redo, but you can set them to do other things. This is a standard feature in graphics tablets nowadays. The pen has no eraser at the back of it, because the back of the pen is where you plug the charger. While the pen is charged, a red light under the pen buttons lights up. The pen comes with a pen holder to place the pen while you’re not using it. Inside the pen holder, there are 8 spare nibs for when the nibs wear off from constant use. You have to change them to avoid scratching the tablet surface. There’s also a nib removal tool inside to help you remove the nib easily. The cute thing is, the pen holder comes open inside the box, to make sure you won’t miss the fact there are spare nibs inside. I noticed that the nibs are the same shape as my Huion Kamvas GT-191 (reviewed here). Huion nibs tend to be slightly cheaper than Wacom’s, and they come in a pack of 10. Let me go through all the stuff I did to install HUION New 1060 Plus, and to see how it worked under different computers & operating systems. While I couldn’t use every single operating system out there, I hope I at least managed to give you an idea on what you will get. Since my experience was very similar across all the systems, I believe that would be the case. The first computer I installed the driver on was a 2013 MacBook Air with both Windows 7 & Mac OS installed. The computer already had Wacom drivers installed in it, I am aware that you’re not supposed to install another brand graphics tablet like that, but I did this on purpose since I heard that it’s possible to have both Wacom & Huion driver on the same computer. In the worse case where things didn’t go well, I have another computer with a clean installation of Windows 7 to try it on, and so you will get to see how HUION New 1060 Plus works both ways. At first, I noticed that you could plug the tablet right away, and it will allow you to move the mouse, but you can’t really click with it anyway. Then I installed the driver in the MicroSD card, which Huion advice you to do while the tablet is unplugged. The driver prompted me to close all the drawing software open, and so I did. After that, it worked right away, and I was able to move the mouse & click with it. To actually start drawing, starting setting the hot keys. Like setting the keys to toggle between the brush and eraser tools, as well as resizing the brush, and few other shortcuts I like to use for drawing (it’s worth noting that I am a keyboard user for the most part, but having these shortcuts close by is useful for simple drawing tasks). I was able to start drawing with HUION New 1060 Plus to my heart content, until I started to have a certain issue with it, where the tablet stops working all of sudden, unplugging the USB cable then plugging it again makes it work again. While that issue may not be a deal breaker for some people, I still preferred if the driver worked without a hitch, as nothing is worse than things that break your workflow like that. At least that’s what I think. At first, I thought the issue was because I had Wacom driver installed on the same system, something that could cause conflicts between the drivers, but then I also faced that problem with the other laptop with a clean Windows 7 installation, so I can safely say that Wacom driver wasn’t the culprit. I faced the issue with driver version 13.14.13,which again, is the one I got in the Micro SD card. Downloading & installing a new driver from Huion’s website seemed to have solved that issue. The version I downloaded was 13.15.35 in case you’re curious about it. Since Huion release new drivers every now and then, you may deal with totally different version numbers, but the trick is the same. So, here’s an advice I keep mentioning in this blog:- Whenever you encounter an issue with your tablet, always try a different driver versions, it could save you a lot of trouble. Sometimes the driver you got with the tablet works right away, and sometimes the ones you download from the website is the best one. The new driver was much better, as it allowed me to work longer, but it still suffered from the same issue. 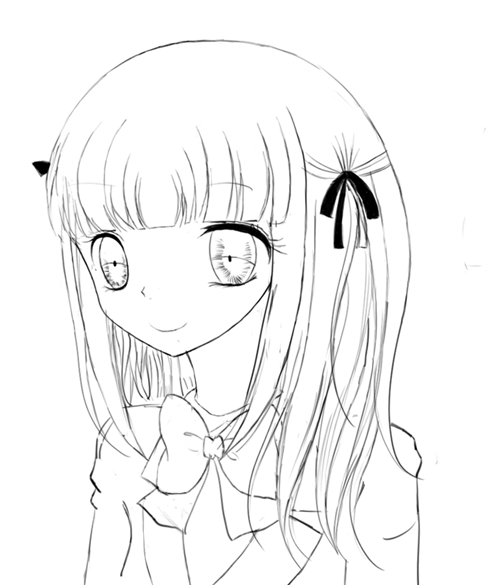 I tried different version from Huion’s site, but I can safely say I wasn’t able to completely solve the issues. I have E-Mailed Huion about this issue, hoping they would come with a solution to this issue. Having superior drivers is the main reason Wacom competitors could beat Wacom in market share in my opinion. I had a very similar experience with all the other computers, which I will illustrate down below. Note that I didn’t include a dedicated section for the computer with a clean Windows 7 installation, as my experience with it was so similar to the one I talked about here. Just like the case with Windows 7, I tried plugging the tablet to my Windows 10 computer right away, to see if I will be able to use it right away. It didn’t work, as I was able to move the cursor but cannot click at all. Unlike my experience with Windows 7, I had to remove Wacom driver to be able to install HUION New 1060 Plus’s driver. Once I installed the driver, it didn’t work, and I couldn’t move the mouse cursor or click (though the hot keys seemed to work). 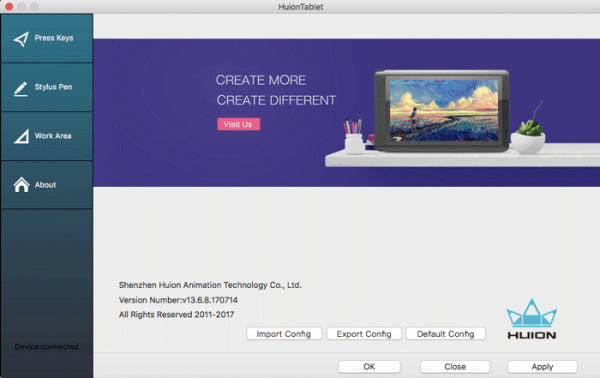 Installing the newest version from Huion’s website solved this issue. That’s where I encountered another issue, where there’s an offset between where the cursor is & where the strokes on the screen appear while drawing. Setting the screen scaling to 100% solves this issue immediately. A small thing I noticed is that driver doesn’t work when system dialog like device manager is up, but it continues working once it’s no long on focus. I have also tried it on Mac OS (Sierra 10.12.2).I installed the Mac driver on the MicroSD card (13.8.6.170714), and it seemed to work right way, but the issue with disconnecting tablet is the same, except that it happens much faster than in Windows. Just like the case with the different versions of Windows, installing the new drivers alleviate this issue. The new driver I got from Huion’s website was 13.0.7.160830 (yes, an older version). Besides testing the driver & to see how much reliable it was. I did a series of tests in all the operating systems I tried HUION New 1060 Plus on. For one, I tried all of hot keys, hot cells, and to change different settings to see how they work, including rotating the active area by 180°. Which is useful for left-handed people, since you will need the hot keys to be at your right side to use them with your right hand. There are times where HUION New 1060 Plus wasn’t detected while the MicroSD card was inserted, removing the Micro SD card solved this issue, which seemed random for me. HUION New 1060 Plus doesn’t support neither touch nor wireless support. In Huion’s driver, I even noticed that the checkbox to enable touch was grayed out to indicate the lack of support to it. Touch is a nice-to-have feature in a graphics tablet. It may be more useful in a pen display like Wacom Cintiq, assuming it worked as it’s supposed to. In my experience with the Intuos Pro & Cintiq Pro 16, I didn’t find myself using it. Wireless is another nice to have feature, since it’s nice to be able to have your tablet on your lap without having to worry about cables, but again, you can totally live without it, especially if you’re on a budget. One last feature I want to mention about HUION New 1060 Plus, which is the MicroSD reader on the side of it, which allows you to read any MicroSD reader you have. While I sure won’t recommend you get HUION New 1060 Plus just for this feature, it’s a very nice to know to have. Particularly if you plan to use it to edit photos from your camera, and if your computer lacks a SD cards reader. Besides some of the driver issues I had with HUION New 1060 Plus’s driver. I had no other serious issue with HUION New 1060 Plus. It’s well-built, easy to use graphics tablet. It has many hot keys, and a MicroSD card reader as a small bonus. 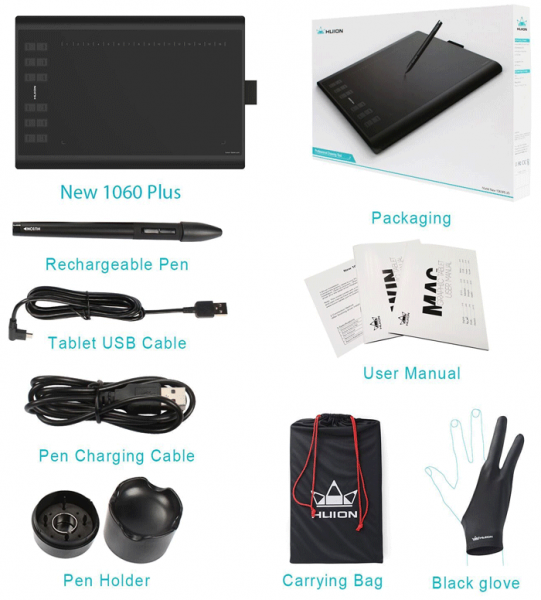 If you’re looking for an affordable graphics tablet, then HUION New 1060 Plus is one good option for you to check out. 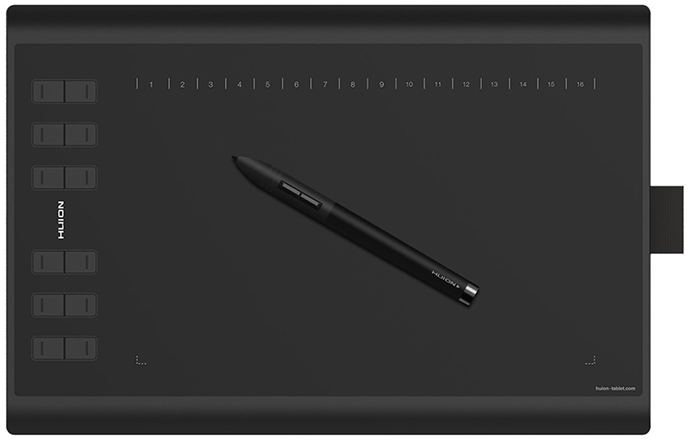 If you are tired of Wacom driver issues,then I probably won’t recommend this for you, unless you just want to try something other than Wacom, since at least the issues I had with this tablet are manageable. Intuos VS Intuos Pro comparison, what are the differences between the two, and which one can one help you create better art?